The trend of taking Backups on disk is a recent trend, reinforced by falling prices, large capacities and speed of recovery of data from the Disk. By default ZMC shows Disk as the choice of media where Backups will reside. For effective restore capabilities, the user  needs to set aside disk space sufficient to hold more than one full Backup Sets worth of Data. If the user  has to make a guess, start with space enough to hold three full Backup Sets and later on adjust it. 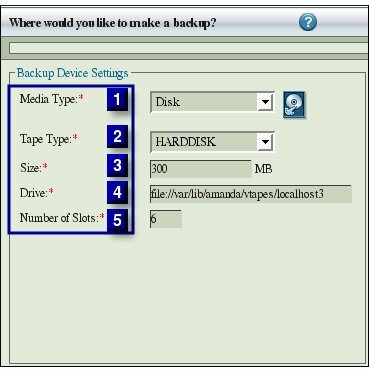 When the media chosen is Disk, ZMC implements a Virtual tape or 'vtape' concept during the backup. Tape Type corresponds to a unique combination of a name and the size of the tape. Specify, the size in MB, of each vtape that will hold an image that will be written to an actual tape at the time of archival. This size will be the same as the size of an actual tape. That is usually defined on the assumption of 1:2 data compression ratio. The parameter Drive (tapedev) should start with prefix "file://" if media (tapetype) is "harddisk"
Error Message is generated if invalid name is specified. So the user needs 12 slots at a minimum. Click the 'Save' Button to save the choices for the Backup Set. ZMC will try to create the slots on the Disk. If the Drive name is valid and the path exists,slots will be created.